The recipe below is from Gotham Bar & Grill, by way of Tuthilltown Spirits. I substituted Harvest Spirits’s Core Vodka and Cornelius Applejack instead of Tuthilltown’s Heart of the Hudson vodka and Busnel Calvados. I don’t need a quart of spiced syrup, and so adjusted the recipe a bit. Shake all ingredients with ice and strain into a cocktail glass. 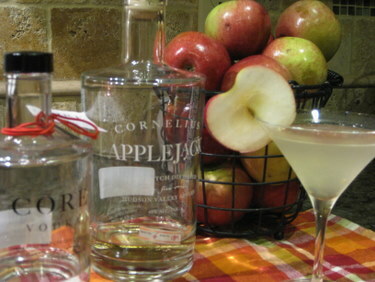 Garnish with an apple chip. Add spices to simple syrup. Bring to a boil and remove from heat. Let steep for 30 minutes. Strain spices from syrup through cheesecloth. Refrigerate syrup.